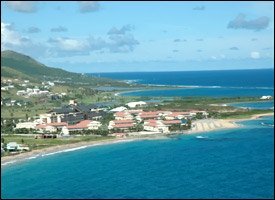 The tourism sector in St. Kitts and Nevis has increasingly become vital to twin-island Federationâ€™s economic growth, but current world economic slowdown and low consumer confidence pose a significant threat to the performance of the local and regional destinations. Minister of Finance, Dr. the Hon. Timothy Harris presenting the 2009 Budget Address in the St. Kitts and Nevis National Assembly on Tuesday said tourismâ€™s contribution to GDP through visitor expenditure, foreign exchange earnings, foreign direct investment and employment generation is critical to the continued economic and social progress of the Federation. He disclosed that although stay-over arrivals in 2007 declined by 10.9 percent to reach 125,026 when compared to 140,248 in 2006, total visitor arrivals to St. Kitts registered a slight increase of 8.4 percent because of the continued robust growth in the cruise section of tourist arrivals. â€œStay-over arrivals declined by roughly the same average as was experienced across the Caribbean, impacted mostly by a decline in U.S. arrivals to our region following the implementation in January 2007 of the Western Hemisphere Travel Initiative. The United States Congress imposed the legal requirement for all air passengers re-entering the U.S. to present a passport, caused a pile up in passport applications by U.S. citizens and slowed the processing of U.S. passports for air travel abroad. U.S. passengers arriving in St. Kitts and Nevis still do not require a passport for entry to our destination, but now they must have one for return entry by air to any U.S. port. The U.S.A. is the largest supplier of visitors to St. Kitts and Nevis, accounting for some 58 percent of total arrivals on average,â€ said Dr. Harris. He said yacht and cruise ship passenger arrivals to St. Kitts and Nevis increased by 21.3 percent to 255,086 in 2007.
â€œThe robust performance of passenger arrivals by sea has continued in 2008 and can be attributed to the very first weekly cruise ship calls at Port Zante which will happen for the entire year. This has resulted in the availability of cruise business at our destination during the normally slow summer months,â€ said Minister Harris. He lauded the ruling St. Kitts-Nevis Labour Party Governmentâ€™s public promise to expand the utilization of the yacht and cruise facilities at Port Zante which is now bearing fruit through aggressive marketing and effective facilitation of an impressive cruise investment and enhancement programme. Dr. Harris noted that tourism is a dynamic industry which has become globally competitive in every respect, with travellers having more leisure options available at better prices than ever before, pointing out that the current world economic slowdown and low consumer confidence pose a significant threat to the performance of the local and regional tourism sector in the last quarter of 2008 and, if the predicted economic recession in the main source markets materializes, the tourism sector can expect to feel the brunt early in 2009.